Michael was born in 1933 in Elizabeth, NJ where he attended public school. In junior high, he showed a flair for art and drawing, and a keen interest in sculpture. That interest, particularly in stone and wood carving which he learned from his art teacher, Mr. Joseph Bolinsky, a now retired professor of sculpture and design, from Buffalo State University, NY. Michael's interest in sculpture induced him to bring a block of field stone slate, which he found in his dad's victory garden, to school. He carved a head of Moses out of this stone which he later entered in the National Junior Scholastic Fine Arts Competition. He competed against junior and senior high school art students and won first prize. This competition was sponsored by the Carnegie Institute of Fine Arts, Pittsburgh, PA, and was judged by 20th century contemporary masters, Alexander Archipenko and Max Weber. 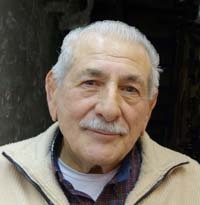 He subsequently won several art awards for sculpture, drawing, and painting during his junior and senior high school terms. Upon graduating from high school in 1951, he was slated to attend Cooper Union Art College in NYC. However, due to the Korean War, he enlisted in the US Navy, because he could not get a deferment from the military to attend art school. During his service, he pursued his art by designing and decorating drill halls for various seasonal social affairs. This involved the layout of large painted murals for stage backdrops, and companion decorations. He also painted murals in the library at the Little Creek, VA Naval Base. After an honorable discharge from the Navy in 1954, Michael attended Newark College of Fine Art, NJ for a short period. This program did not appeal to him and he reentered the military be enlisting in the US Air Force. During this tour of duty, he spent three years overseas in England and Europe. He received and honorable discharge from the Air Force and returned to civilian status. He later migrated to the state of Maryland. He always retained his objective of attaining a formal education and in 1969 he graduated from the University of Baltimore with a law degree with greatly enhanced his civilian career in federal service. He retired in 1989 and moved to Hampstead, MD where he maintains his home and studio. Michael has been very active in the fine arts during his federal service and subsequently he entered and won over 24 awards for his sculptures on the national and regional levels. He is a published artist appearing in Men of Achievement, Artists USA, and Artists of Renown. He has also been featured in many newspaper articles and on cable TV. 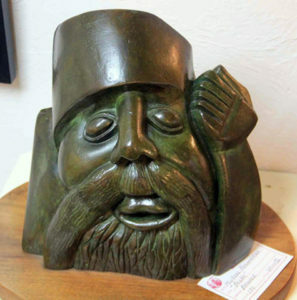 He awards include first prizes for sculpture at the Atlantic City, NJ National Fine Arts Shows, Rehoboth Art League, DE, Museum Award for Sculpture at the 65th Cumberland Valley Fine Art Exhibit, Washington County Museum of Fine Arts, Hagerstown, MD. He has had over 12 one-man shows, and has exhibited his work at Johns Hopkins University, and in fine art galleries in NYC, New England, and the Midatlantic states. 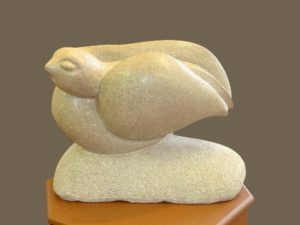 He is a member of the faculty of the Rehoboth Art League, DE and he has conducted sculpture lectures and seminars at Shippensburg State College, PA, Mt. St. Mary's College, MD, Carroll Community College, MD, and judged national and regional art shows. 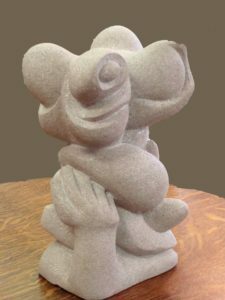 Michael's sculptures are in public art collections, including The National Gallery of Fine Art, Athens, Greece, Shippensburg State College, PA, city of Atlantic City, NJ, and public schools of Elizabeth, NJ. His works are also in private collections in the US, Europe and South America. During his art career of over 50 years, his sculptures have been critiqued as being representational and symbolic. He considers his work to be definitive in form and subject matter. Because of his sculptural forms therein. He states that the intermediate stage of sculpture, when the forms are given life and meaning, is the most gratifying to him. Many of his sculptures are executed without a model or maquette, but in creating and executing commissions for clients he does prepare drawings and models accordingly. Among his commissions are figurative and various animal sculptures. His fondness for surrealism is also prevalent in many of his sculptures. Although Michael prefers to work in stone and wood, he also enjoys creating in bronze pieces; additionally, he had designed several pieces in 14 kt. gold with blue sapphires. He obtains the stone and wood from various suppliers, and is of the hard wood variety, including oak, walnut, ash, teak, and is of veneer grade quality. In reflecting on his long and fruitful art career, he is appreciative of his art training during the 20th century, and he maintains that he will continue to be creative in fine art sculpture for as long as he is able.